Clark Seif Clark (CSC) offers testing and consulting services to help identify asbestos hazards to prevent human exposure risks and costly violations. Even today with the asbestos regulations that are in place, workers and their families could be at risk if a worker has not been properly trained or informed about asbestos-containing materials they may handle or come across. Several years ago, an Oakland, California jury awarded over $27 million in compensation to an elderly couple. A lawsuit had been filed because the wife of a man who worked with asbestos insulation years before developed mesothelioma. The couple claimed her condition was due to her husband exposing her to asbestos fibers he inadvertently brought into their home. This type of exposure to family members is often referred to as secondhand, secondary or take-home asbestos exposure. Asbestos is the name given to six naturally occurring fibrous minerals. These minerals offer unique properties so they were used for decades in thousands of building materials and commercial products. While most of these products have been phased out over the past several decades, they can still be found in some older properties. The Agency for Toxic Substances & Disease Registry reports that significant exposure to any type of asbestos will increase the risk of mesothelioma, asbestosis and lung cancer. They also report that asbestos-related disease has been diagnosed in not just workers that dealt with asbestos and asbestos-containing materials, but also with family members. 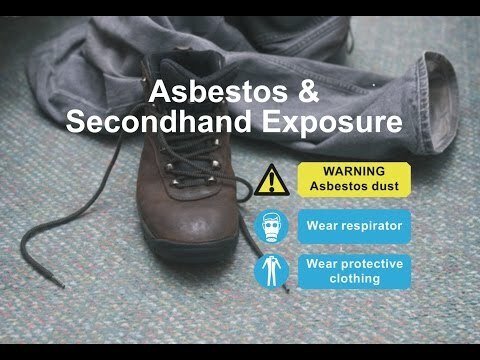 The National Cancer Institute states that this risk is thought to result from exposure to asbestos fibers brought into the home on the shoes, clothing, skin and the hair of workers. To learn more about asbestos or other environmental, health, occupational, indoor air quality and safety testing and consulting issues, please visit www.csceng.com, email csc@csceng.com or call (800) 807-1118.